BSF Notification is out. 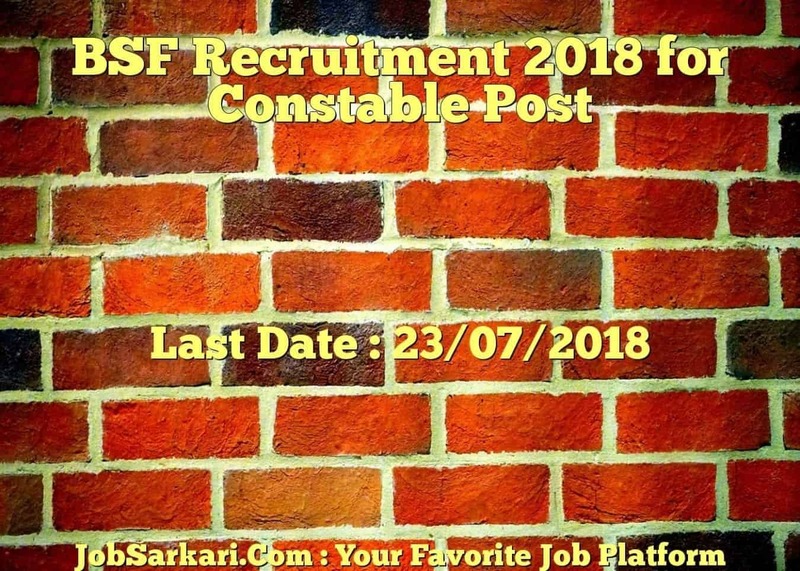 BSF is recruiting for 207 Constable Post Posts. You can check BSF - Border Security Force last date, download BSF notification, visit BSF official website and check other BSF Vacancy details.Complete Vacancy and recruitment Details about 207 Constable Post vacancies in BSF are provided below by JobSarkari.Com only for you. Last Date for Receipt of Application Form 23/07/2018. SC / ST No Fees. Mode of Payment Candidate Need to Draw a Postal Order or Bank Draft in Favor of as Details Given in Payment Details. CT Auto Electrician 07 00 07 03 17. CT Welder 16 00 03 00 19. CT Upholster 17 02 00 03 22. CT Turner 09 00 03 02 14. CT Carpenter 13 00 04 03 20. CT Store Keeper 08 01 02 03 14. CT Painter 09 05 02 02 18. CT Vulcanize or Operator Tyre Repair Plant 05 00 01 01 07. CT Fitter 09 00 00 02 11. CT Black Smith or Tin Smith 13 00 00 02 15. Total No of Post 143 08 32 24 207. Candidate Must Have Passed Class 10th and ITI in Related Trade or Three Years of Experience in Same Trade. Maximum Age for SC / ST 30 Years. Maximum Age for OBC 28 Years. 165 cms (157 for Female) Proportionate to Height 75 cms After Expansion 80 cms. Run 3.2 kms in 17 Minutes. 1.6 kms in 09 Minutes. 02. Jalandhar The Inspector General, Ftr HQ Jalamdhar, BSF Campus, Jalandhar Cantt-144006. IG BSF Punjab Ftr SBI BSF Campus Jalandhar Code No. 6596. 03. Jodhpur The Inspector General , Ftr HQ BSF Campus, Mandore Road Jodhpur (Rajasthan) - 3422026. IG BSF Rajasthan SBI Mahamandir Code No.12847. 04. Gandhinagar The Inspector General Ftr HQ BSF, Gandhinagar, (Gujarat) - 382042. IG BSF Gujarat SBI GC CRPF Gandhinagar Code No.6825. 05. Delhi Commandant 95 BN BSF, Bhondsi Campus, Near Sohna Road, District Gurgaon Haryana - Pin-122102. Commandant 95 Bn BSF SBI Badshahpur Code No.02300. 06. Kolkata The Inspector General, Ftr HQ BSF, South bengal, 2-B, Lord Sinha Road, Kolkata (West Bengal) - 700071. IG BSF South Bengal, SBI Service Branch Kolkata, Code No. 8554. 07. Guwahati The Inspector General, Ftr HQ Guwahati, BSF Campus Patgaon, PO-Hazara, Distt-Kamrup, Guwahati-781017. IG BSF Guwahati SBI Airport Guwahati, Code.03776. 08. Banglore The Inspector General, STC BSF Banglore, PO-Yelahanka. Banglore - Karnatak - 560063. IG STC BSF Banglore SBI AFS Yelahanka Code no.02187. 09. Hazaribagh The Inspector General, TC & S Hazaribagh, BSF Meru Camp, Hazaribagh Jharkahnd-825317. IG TC&S BSF Hazaribagh SBI Meru Camp Code No.2922. 11. Srinagar The Inspector General, ftr HQ BSF Srinagar, Humhama, PO-Humhama Distt-Budgam J&K PIN-190003. IG BSF Srinagar SBI Barzulla Srinagar, Industrial Estate Code No.1527. 4.Candidate Need to Send the Application for to the Address Given in Postal Address Section Given Above. 5.Offline Application Shall be Received till 23rd July 2018. Q. What is the Last Date For BSF Constable Post Vacancy ? A. 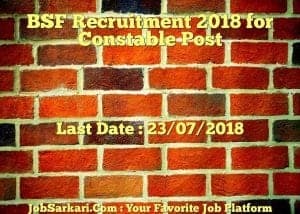 Last Date for BSF Constable Post Posts is 23/07/2018. Q. What is the Form Type of BSF Constable Post Recruitment ? A. The Form Type for BSF Constable Post Posts is Offline. Q. How many vacancies are available in Border Security Force Constable Post Posts ? A. There are about 200 Vacancies in Border Security Force Constable Post Posts. Q. What is the Full Form of BSF ? A. Full Form of BSF is Border Security Force .